This first series of prints "25 days 11 countries" taken in 1958 was the first and last of its kind to celebrate the inaugural flight of the Boeing 707. It was bit of a spoof of Phileas Fogg in Around the World in 80 Days. Gleb took Ruth on the journey of a lifetime from Victoria Harbor and Kowloon, Hong Kong, Ceylon (modern Sri Lanka), Jaipur and New Deli, India, Nara, Japan and Athens, Greece. Gleb’s photos brilliantly captured a sunrise at the Temple of the Dawn in Bangkok, Thailand, and a flamenco serenade at Las Cuevas de Luis Candelas Restaurant in Madrid, Spain. This series introduced “Stop Over Fashions for the New World Traveler” to fit the sport of getting there and everywhere, spanning the globe in attire. The new concept of “en route” fashions was shown for the first time in conjunction with TWA and Northwest Airlines. For the cover article "Traveling by Jet, Fashion on a New Plane", Harper Bazaar’s sent ONE fashion editor (Bruce Clerke), ONE model (Ruth Neumann), ONE photographer's assistant (Minoru Ooka) and ONE photographer (Gleb Derujinsky). The dramatis personae traveled with nineteen pieces of luggage packed with thirty dresses, a dozen pairs of both shoes and gloves, seven pairs of sunglasses, cosmetics and hairspray! This exhibit beautifully showcases some examples of this historic adventure. Harper's Bazaar Japan paid tribute to Bazaar's legendary photographers in a beautiful feature article in its January 2015 issue. Among them were Gleb Derujinsky, Avedon, Peter Lindbergh, Man Ray, Frank Horvat, Louise Dahl Wolff, Neal Barr, Diane Arbus, Lisette Model, Jeanloup Sleff, and Rico Pullmann. Gleb Derujinsky's photography was featured in Louis Vuitton's most recent book "Louis Vuitton Fashion Photography" published by Rizzoli. The book celebrate's the fashion house's rich history with extraordinary images from master photographers. 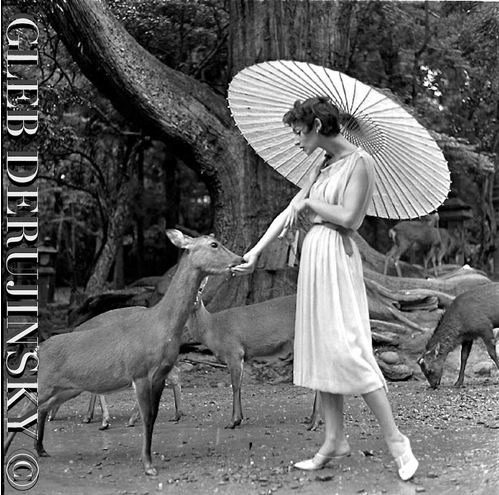 "Gleb Derujinsky was one of the greatest fashion photographers to have ever picked up a camera, and yet many barely know his name. In their Spring 2013 UK, USA and Asian editions, Glass magazine pieces together the archives of a lost legend in the article “A Passionate Eye”. Famous models and fashion editors of the 1950s and 1960s worked with Derujinsky, and with the help of his daughter Andrea and her tireless work to rebuild her father’s archives, Editor-in-Chief Nicola Kavanagh has been able to create a snapshot of his remarkable work and speak to the people who helped make his work possible. Click on the image to see article.